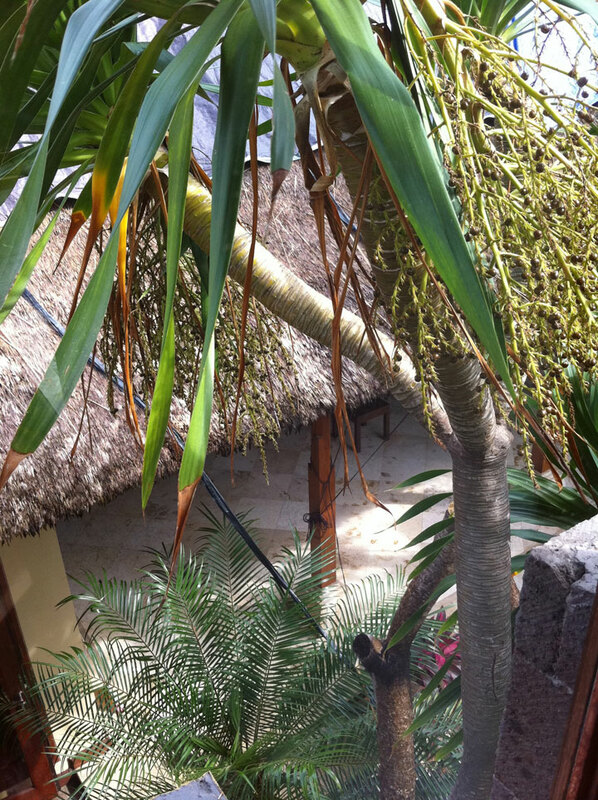 I am sitting at my kitchen table in Bali. 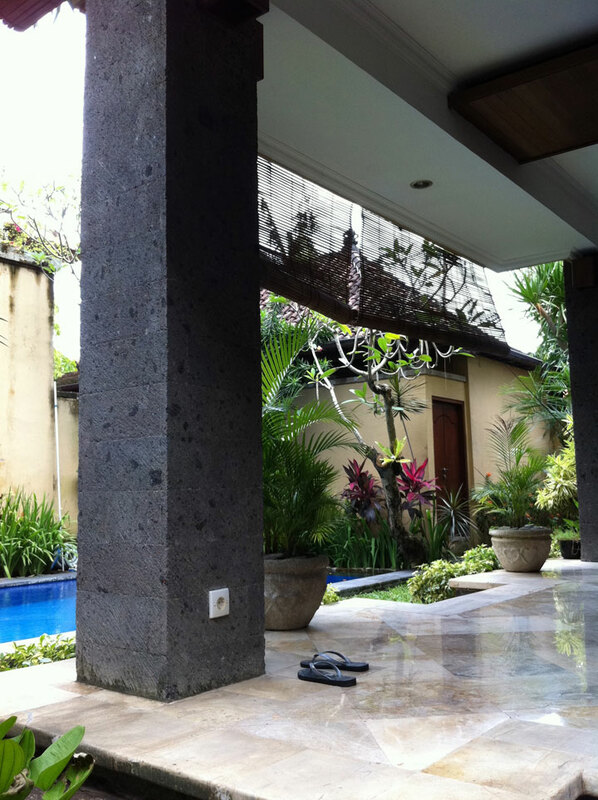 Two sides of the room are open to the elements, which is typical of tradional Balinese houses. There are no doors, no windows to the outside, just the kitchen sink, cooker, worktop, table and chairs and Mother Nature surrounding us. The broad, open side of the kitchen, faces directly into the courtyard garden and on the shorter side to my left, a teak walkway crosses a pond filled with lotus plants and fish which then leads on to one of the bedrooms. As I sit writing this, I have to pinch myself, it feels like a dream. Actually it is a dream…come true. It has just started raining, which brings relief from the humid air as it’s hot today. A sudden shower of rain has descended, quite literally out of the blue. Plump, warm, raindrops start to fall, and with every passing minute they build up in momentum and the crescendo builds, the shower becomes torrential. 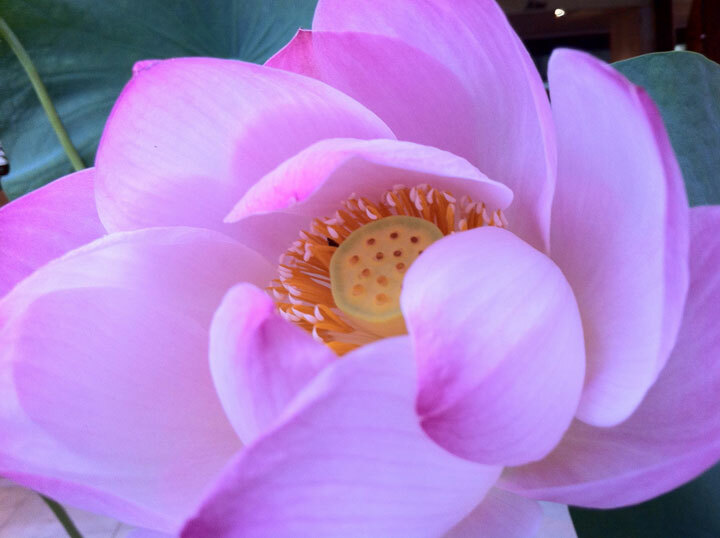 It bounces off the lotus leaves in the pond, teasing the fish like bait as they hit the water. 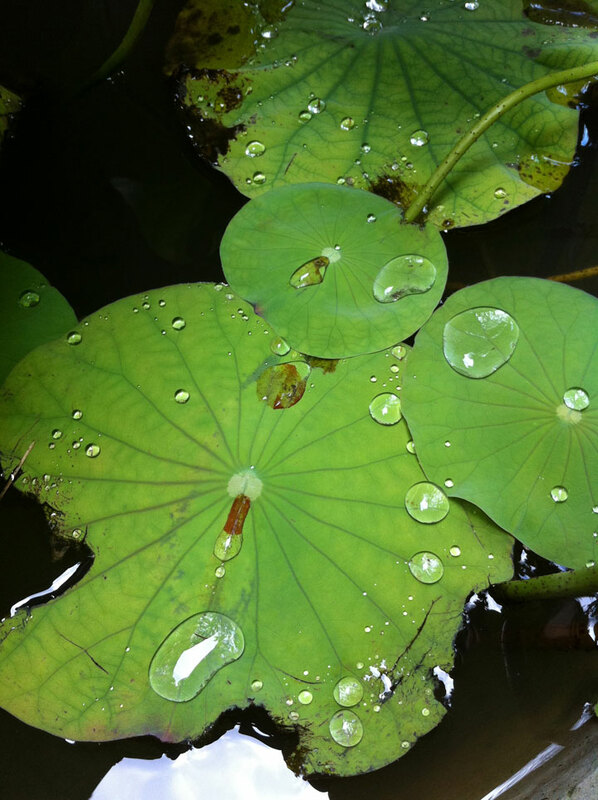 Mercurial, the rain’s droplets slither their erratic course down the ridges of the rubber plants, the fronds of the palms, the waxy stems of the orchids before resting like clusters of diamonds, sparkling jewels in the centre of the cupped, vivid green leaves, some as large as an elephants ear. Splishing, sploshing, splattering, all around the cacophony of sounds of the rain resonating off the buildings and vegetation with pings, splats, and thuds. 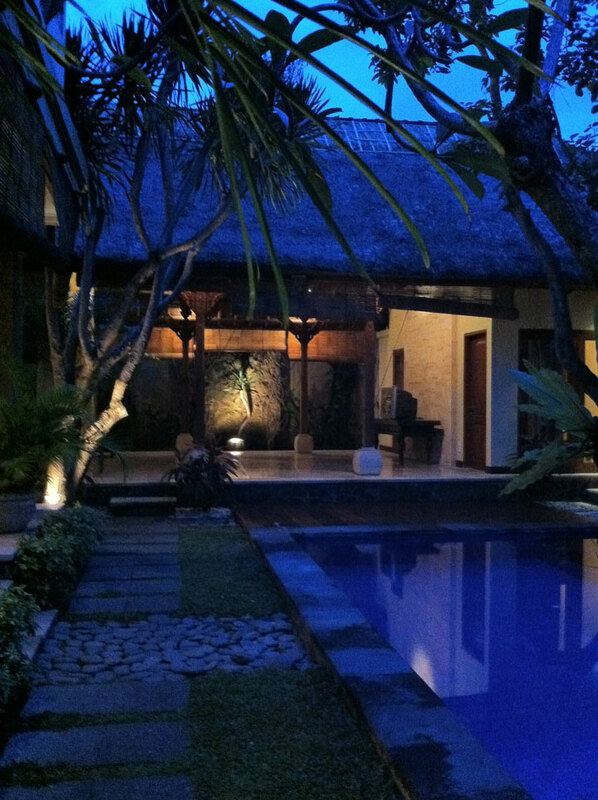 Rain, dancing on the pool, splashing over the plants, dripping down off the thatched ylang ylang roof, soaking the flat, smooth, black pebbles of the pathways, making slippery the wooden boards of the walkway, and the cool marble of the steps. The gentle Zen like music of the fountains in the fishponds are no competition for the robust, eclectic mix of percussion made by the rainfall. The smell of the rain hitting the heat of the day makes the atmosphere pungent, dank, and heavy. Earthy, musky odours pervade everything. Then it stops. The rain stops as suddenly as it started. The southern equatorial Sun bursts through, the burning heat, descends from a now perfect azure sky. Clouds of steam rise up from the garden plants, wooden boards, pebbles; roof thatch and walls, as if a magician had cast his wand and with smoke and mirrors had transformed everything. The only sound to be heard, apart from our neighbour’s prize cockerels crowing, is Wayan. Wayan is working away at her pengulekan (please excuse me if I’ve spelt this wrong) Her special mixture of coriander seeds, cinnamon bark, cloves, garlic, galangal, ginger root, shallots and chillies. Oh, so many chillies, maybe too many chillies for the Irishman? 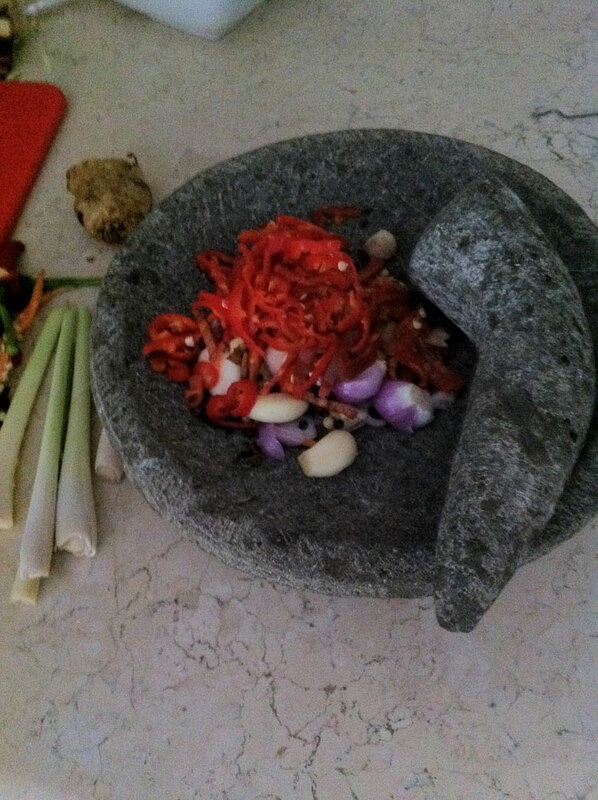 For 20 minutes she patiently grinds the horn shaped pestle into the volcanic stone of the mortar bowl, rhythmically pounding away at the mountain of spices, lost in meditation. 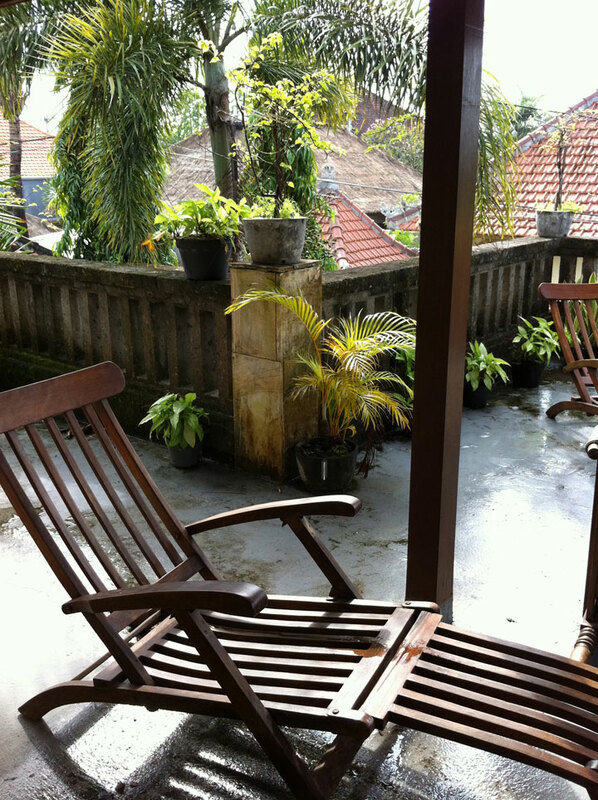 By the time she has finished today’s sambal, the steamy remains of the downpour have evaporated, the air has become dryer and the garden glows once again in verdant tropical splendour. Thanks Tom, I always appreciate your comments. P.S the rat has just run through the bar again……..
and, the reason that I’m in the bar again? is that I have no internet at home! 1 rat is nothing against that ant-invasion this morning. Compared with that, D-day was a joke. Oh Lottie, i am so pleased for you, and so jealous. My diary (mainly work) is just ridiculous at the moment, although i am enjoying the new job, its a bit overwhelming in terms of hours and days in. Can we start planning my trip? I can smell and taste Bali already? Loved this post, your best yet, so atmospheric. These photos are gorgeous, Lottie, and I love how you describe everything. Thanks Lovely, I always appreciate your kind comments. Hope one day, you and yours can make it out to stay. I’m sure you will like! Why only pretending to listen? Why not listen to Balinese music? Not enough illusional harmony? Tom, I like yours too! Very much. I am always happy to see other peeps stuff. Have you left a comment on Maurizio’s youtube? If you haven’t, then tell him yourself. I’m always happy for people to do ‘self promotion’ on my site if it’s something related to Indonesia. In hindsight it might have been nice if Maurizio had actually commented on what I had written as well as put his youtube video on! Corinne, great to hear from you and thanks for your comment. Yes, time has a totally different meaning in Indonesia from the UK. It’s affectionately called ‘elastic time’. I suspect that one of the main things that I will learn from living here is patience, which let’s face it, is a virtue!